The average cost of assisted living in Richmond is $3,585 per month. This is higher than the national median of $3,346. To help you with your search, browse the 25 reviews below for assisted living facilities in Richmond. On average, consumers rate assisted living in Richmond 4.0 out of 5 stars. Better rated regions include Greenville with an average rating of 4.9 out of 5 stars. Caring.com has helped thousands of families find high-quality senior care. To speak with one of our Family Advisors about assisted living options and costs in Richmond, call (855) 863-8283. Richmond, which is located in the eastern region of central Indiana, is a small city that is home to a little over 35,000 people. The city has a sizable senior community, with residents over the age of 65 accounting for over 17 percent of the population. To support the aging population, the city offers five assisted living facilities, and there are another three nearby for seniors to choose from. These communities house at least five seniors and provide at least one health-related service and at least two scheduled supportive services. These facilities, which are officially known as Residential Care Facilities (RCFs), are monitored and licensed by the Family and Social Services Agency Division of Aging. Richmond has a very low cost of living, with overall expenses coming in nearly 30 percent below the national average. Seniors can expect to spend roughly 10 percent less on groceries and health care and about 30 percent less on transportation here than they would elsewhere in the country. Indiana is a fairly tax-friendly state for seniors. Social Security benefits are not taxed, though income from retirement accounts or pensions are subject to income tax. Seniors should speak with a financial expert to determine how the state's laws will impact their assisted living budget. The overall crime rate in Richmond is 48 percent higher than the national average, and residents have a 1 in 24 chance of being the victim of a crime. While most assisted living communities have security systems to keep residents safe, the city's high crime rate may be a concern for some seniors. Public transportation in Richmond is provided courtesy of Rose View Transit, which operates several fixed routes and demand-response routes via the para-transit service. Seniors who are age 60 and over are eligible to receive discounted fare. The Richmond area is home to world-class medical facilities, including Reid Health, in the event of medical emergencies or illness. Richmond has an array of community resources for seniors, including the Widowed Persons Service, an organization that provides emotional support for seniors who have been affected by the death of a spouse, as well as one senior center. Assisted Living costs in Richmond start around $3,585 per month on average, while the nationwide average cost of assisted living is $4,000 per month, according to the latest figures from Genworth’s Cost of Care Survey. It’s important to note that assisted living rates in Richmond and the surrounding suburbs can vary widely based on factors such as location, the level of care needed, apartment size and the types of amenities offered at each community. Seniors in Richmond who meet income restrictions may be eligible to receive financial assistance to help pay for their assisted living expenses. 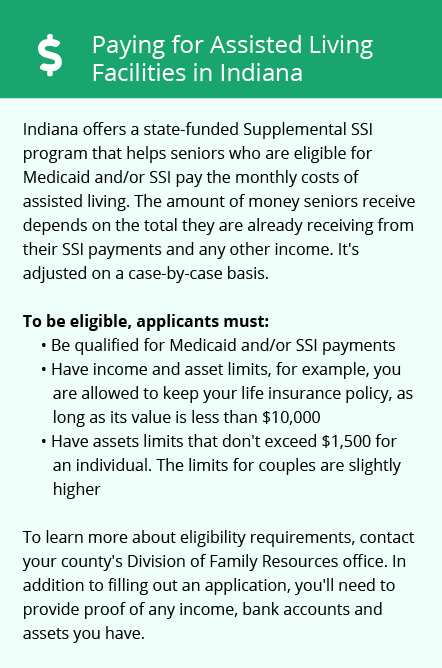 State programs that may provide aid include Indiana Medicaid, the Medicaid Aged and Disabled 1915 (c) Waiver program and the Indiana Residential Care Assistance Program. Learn more about these programs, plus who’s eligible, on our Assisted Living in Indiana page. For more information about different ways to finance assisted living, visit our Assisted Living in Indiana page. Richmond and the surrounding area are home to numerous government agencies and non-profit organizations offering help for seniors searching for or currently residing in an assisted living community. These organizations can also provide assistance in a number of other eldercare services such as geriatric care management, elder law advice, estate planning, finding home care and health and wellness programs. To see a list of free assisted living resources in Richmond, please visit our Assisted Living in Indiana page. 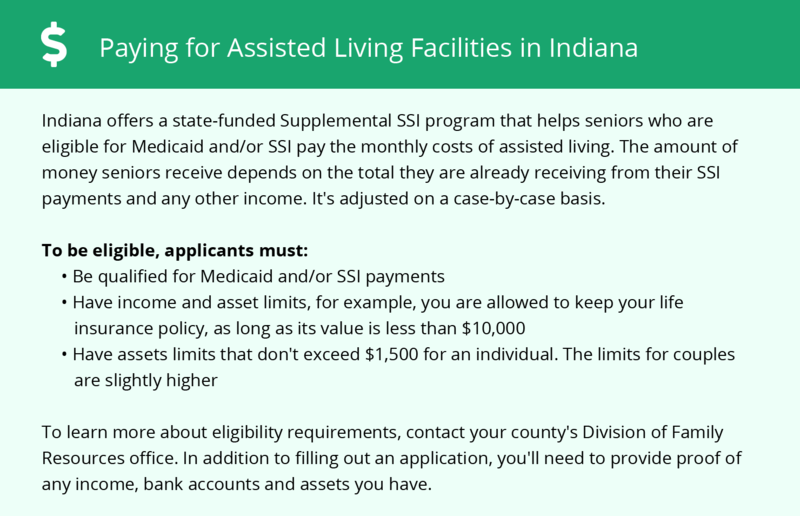 Richmond-area assisted living communities must adhere to the comprehensive set of state laws and regulations that all assisted living communities in Indiana are required to follow. Visit our Assisted Living in Indiana page for more information about these laws.